Are you searching for a sporting clay shooting instructor in Tampa, Florida, or any nearby area? If so, you’ve come to the right place. 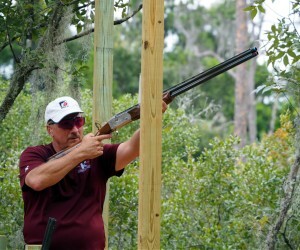 At Florida Sporting Clays, teaching shotgunning skills for sporting clays, and other recreational and competition shotgunning sports, is our passion. We take great pride in helping individuals who can’t seem to break certain clays turn that frustration into delight after seeing the pieces of clay scatter in the sky. So, whether you’re trying to break into the 90s on the course or you’re just getting your feet wet in the sporting clays world, we’ll be here to help you bust more clays. If you’d like to learn more about seeking out sporting clay shooting lessons from Florida Sporting Clays in the Tampa, FL, area, please contact us today to inquire about instructor availability. We’ll happily help you take your sporting clays game to the next level and help you have for fun doing it.